Cryptomundo is rightly ticked off by the name dropping of Sasquatch on the new “Adventure’s of Bobby Bigfoot” website designed to teach kids about sustainability and green living. See, we leave a carbon footprint, Bigfoot has a big footprint, so you shouldn’t be a Bigfoot when it comes to carbon emissions. Blah, blah, blah. But Sasquatch isn’t some tip-toeing green poster boy. Hell no! He’s mean mother loving devotee to the Earth. When will Earth Day organizers look to the family bands of Sasquatch out there trying to survive in the environment for the logical icon? Actually, damn, Sasquatch are protectors of the environment, aren’t they? The Earth needs warriors, as well as educators, but certainly not neurotic kids!! 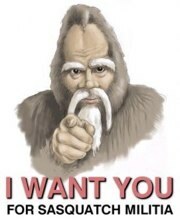 It is time for the Sasquatch to be promoted as the ultimate Earth Day symbol. There is a cause we can get behind!